I’m trying a new format. With all the recipes on one page, it’s difficult to search for a specific one. Even I’ve had trouble finding recipes on that page, and I wrote them! From now on, I’m going to put the recipes in the post with the stories about them. By request from my sis the Kitchen Kween, I will make sure the recipes are in blocks and not chopped up with pictures so it’ll be easier to select the text and print just that, if you’re into printing things. Hopefully it’ll be easier to find what you’re looking for! Besides a new format, I have a new dog! We brought Riley home from Wayside Waifs yesterday. 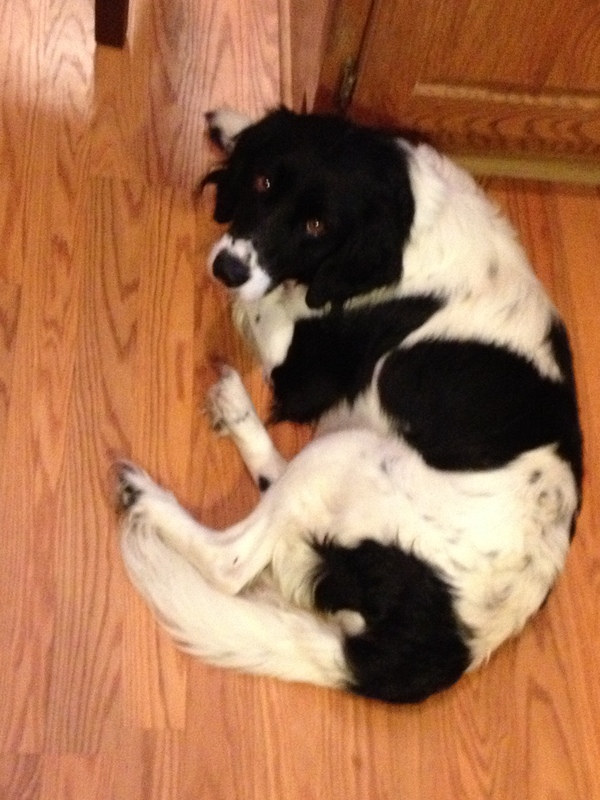 He’s a spaniel mix and a real sweetie. I think he likes to cook – he “helped’ me in the kitchen this afternoon. So far he isn’t interested in doing the dishes, though. Thanks for reading my blog and trying my recipes. I’m always interested in your suggestions and feedback, so don’t be shy!